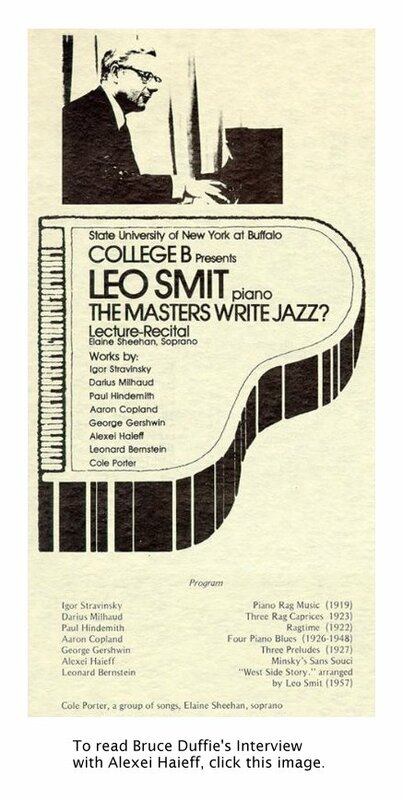 Leo Smit Interview with Bruce Duffie . 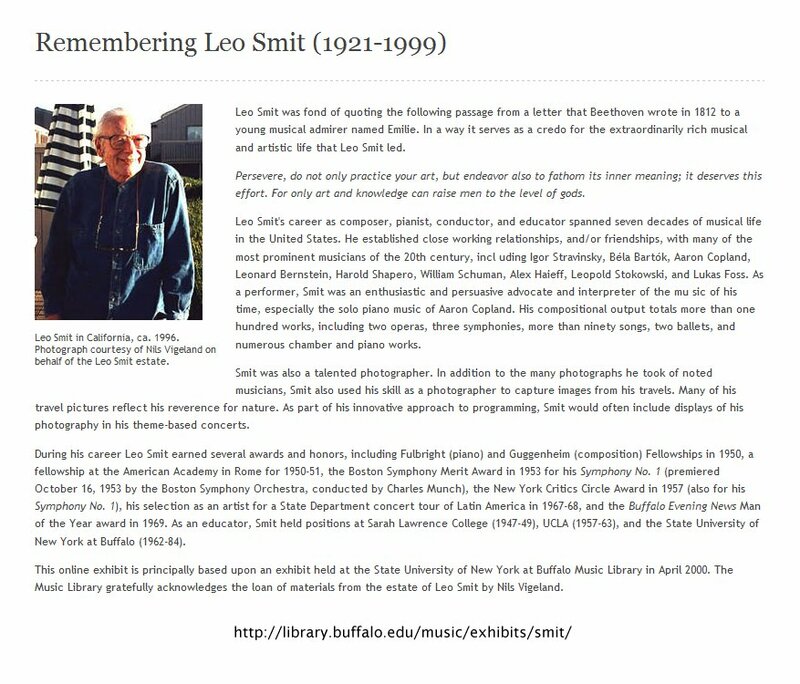 . . . . . .
Smit was a most interesting fellow, as can be seen in the following tribute (originally posted on the SUNY Buffalo site) . . . . . In the days before e-mail, the typed (or handwritten!) letter sent through the US Postal Service was the usual method non-telephone of communication. 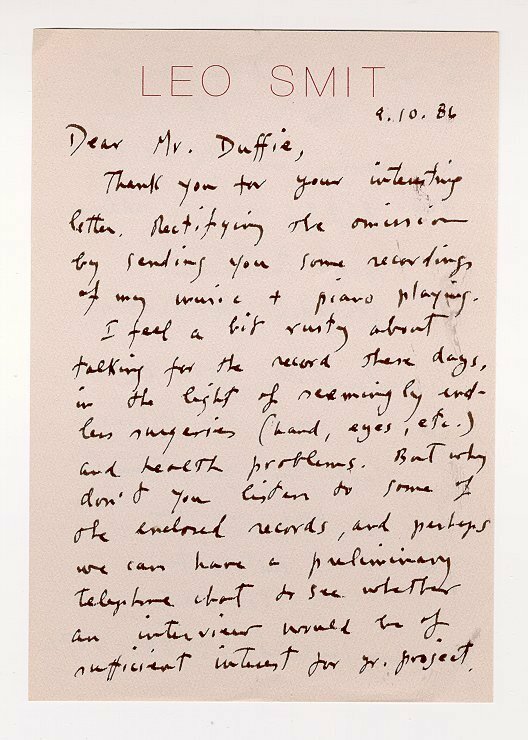 Back in the 1980s, with the help of agents and publicists, I wrote to a number of composers to ask about doing interviews. Most of them responded, and appointments were made. 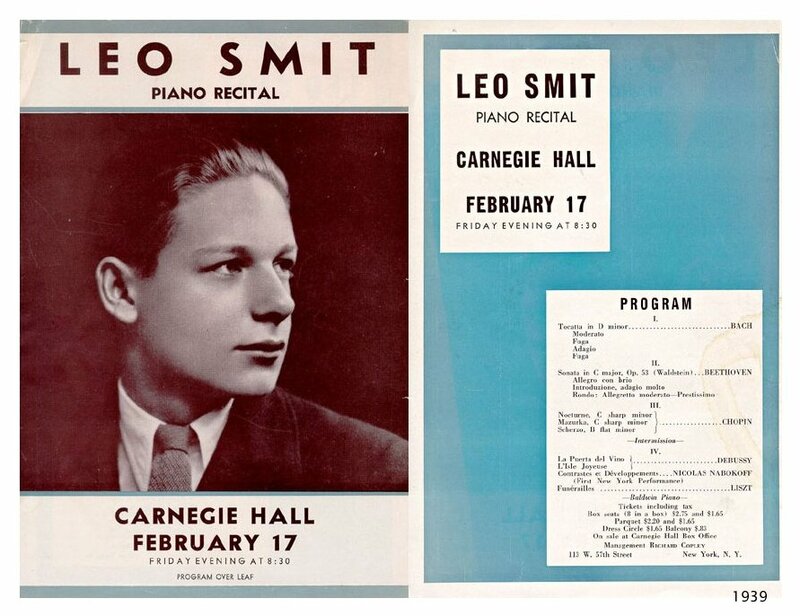 The one I received from Leo Smit is shown next . . . . .
After using the material on WNIB a couple of times, I am pleased to present this transcript on my website. Not long after our written back-and-forth, we set the date and time for our conversation, and naturally I made the phone call exactly as specified . . . . . . .
BD: Did you get your new phone? LS: Yes, indeed! Just put it in. I am luxuriating here. BD: Good, good. I’m very glad that you have decided you can spend an hour talking with me. I appreciate it. LS: Let’s see how it goes. BD: Okay. You are a pianist and a composer and a conductor and a teacher. Which of these is of primary importance, if any? LS: When I’m playing somebody else’s music, I’m a pianist/composer. When I’m playing my own, I’m a composer/pianist. When you’re composing, you’re nothing but. I’ve also had some experience conducting, and I find that very exciting to stand up in front of an orchestra and conduct — or direct the airwaves as they come blasting upon you. I’m thinking particularly of a performance of Tchaikovsky’s Third Symphony, the climax in the final movement. To be a conductor, you’ve got to have tough knees, because they really buckled under me at that moment, it was so overwhelming. BD: Are you a better composer because you are also a pianist, and vice versa? LS: I think so. I’ve been told so. Some people have commented on that connection, yes. As a composer, you have first-hand experience encountering the kind of problems that other composers work with. You’re all related, in that sense. You’re all fellow workers, and it enables you to understand, to see more clearly into the working minds of other composers. At least you have that illusion; you have that perception. It may be a delusion, but at least it gives you a base from which to radiate out, to think out. BD: Is this something that you encourage in others, this multi-faceted-ness, rather than specialization? LS: Yes, I have, as a matter of fact. One of the most interesting examples of that was working with a piano student at SUNY Buffalo, and being rather discouraged by the chap’s lack of progress. The weeks followed each other uneventfully until near the end of the semester. I asked him if he had ever written anything, and he looked quite shocked at the idea. He said, “No,” so I asked him, “Why don’t you try writing something in a simple dance form? A minuet or a gavotte, a polka, anything that comes to mind?” He came the following week with a charming little piece, and for the first time his playing had touch. It had substance. It had character because he understood his own piece. He knew what he wanted to say, and that must have been a revelation to him. Subsequently he went on to teach theory at Brandeis University, whereas before that I really had no hopes for him in the musical professional at all. BD: It’s something that captured his imagination, then. LS: Obviously, yes. Having done it, having written a few notes, you have an idea of how you want them to go. That’s reflected in certain performers who can identify with composers of their own time, and through them, composers of the past. They seem to have the knack of capturing or understanding the character of the work as though they had written it themselves. It’s the kind of ability to get into the composer’s mind, as it were. You may or may not be right, but there will be a kind of authenticity in that approach, and a kind of identification. BD: I assume that the act of performing is interesting to you. Is the act of composing interesting to you? LS: It’s so different. Performing is not only interesting, it’s a pleasure. Composing isn’t often a comparable pleasure. First of all, when playing, for the most part you’re choosing a finished masterpiece or something that’s of interest to you. In the process of composing, you are living in a period of uncertainty, of not knowing, which probably is the key to getting somewhere, to arriving somewhere. If you know exactly where you’re going, it is probably not worth writing. So at the end, you can look back upon this stony road with a certain amount of satisfaction, realizing that you had traversed it and it had come off like you had hoped it would. Not planned, but hoped. BD: Are there no surprises, then, when you play a masterpiece? LS: Constantly, especially works on the scale of the Diabelli Variations, the Bach Well Tempered set, especially Book Two, which I’m particularly fond of. There are certain works that interest you every day of your life, and instruct you, teach you, from which you can learn so much. It’s not necessarily a surprise, but a deep pleasure in seeing how the composer did it again and again. There are certain works that you can never get to the bottom of. Mozart is the great magician that way. He defies your best attempt at analysis. All you can do is smile. 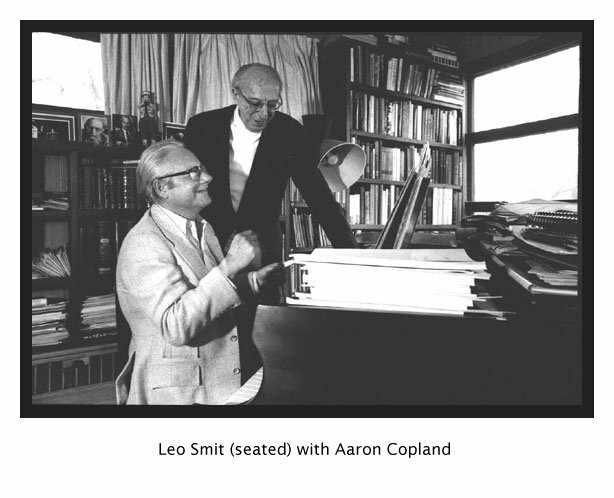 BD: Can people get to the bottom of the works of Leo Smit? BD: When you’re performing a program that has both your works and other people’s works, does your expectation of the audience change from one to the other? LS: You mean, do I expect them to applaud my music? BD: Well, what do you expect of an audience that comes to hear your music? LS: I really don’t know. I don’t think they know. You have to give them more time to decide. BD: What can the audience expect of you as a composer? LS: It’s really hard to say. It is difficult to speak about one’s own music, let alone dig for the ear’s sensibilities of it. It’s very hard to know what other people really hear — whether they hear the same thing you do, or have the same background or same reference, or maybe similar sensibilities. In fact, audiences are a very mysterious animal, composed of so many different parts that it’s hard to speak of it as a unified body. BD: Then for whom do you write? LS: I think music, basically, is a conversation among music makers, and that audiences sometimes eavesdrop — as when there’s a public forum. They listen in on the conversation, and depending upon their knowledge and background and experience, they’ll get some of it and miss quite a lot at the same time because it is a kind of a secret language, in a way. The mystery, for me, is that it’s how certain works of music can become almost universally admired and loved. I think it’s extraordinary. If Bach or Mozart could come back today and look at Schwann’s catalog or look over the prospectus of the various orchestras, I think they’d be astonished at the widespread popularity of their music; and not mere popularity, but how much they are loved and needed. BD: Do you expect the music that you write to last for generations? LS: That, one can never know. If you were to ask someone like Mendelssohn, “What do you think your future would be?” he would probably be very confident. There was quite a long time when his music was entrenched. Then, suddenly, there’s a revival of interest and the composer has a wave; he’s on a wave. Bach is a very good example of someone who was not thought of very highly for a long time. People had largely forgotten him, and when the St. Matthew Passion was rediscovered by Mendelssohn, it created a tremendous furor among musicians, and his influence has been powerful ever since. But you can never know because everything comes in waves. Even Mozart was considered sort of light and rococo by our grandfathers. Today he’s considered, properly so, in addition to being very light, also very deep. So it’s impossible to predict the future. BD: About the waves of public opinion—is the public always right? LS: No, it’s not a question of being right. It has to do with need, basically, and this goes for musicians as well. Certain composers are not played for a long time, and then suddenly there’s a tremendous resurgence of popularity. Things somehow just speak for that particular generation or that particular time. Mahler’s a pretty good example. In America he was not as popular as he is today, or has been for the last ten to fifteen years thanks to the rediscovery by people like Bernstein, for example. It’s a very iffy game, but if there is enough substance to the music, even though it may not be popular during a particular decade, there’s a good chance that it will interest a music lover of another generation. If there are certain complexities that will make you want to come back and try to fathom the mystery, that will bring you back to it eventually. In other words, if it’s too simple it doesn’t have too good a chance. Not that it must be complicated, but it must have a core complexity which will give it depth and dimension. BD: Are there some pieces that are languishing on library shelves now, that you would like to see brought back into the forefront? LS: We’re living in wonderful times, as far as musical discovery is concerned. For instance, I remember hearing the name Gesualdo for the first time when I was about seven years old, from the lips of Tibor Serly, who was a friend and a disciple of Bartók. He was telling my father, who was a musician, and me, about Bartók’s discovery of this extraordinary composer called Gesualdo. Then nothing happened until fairly recent times when Stravinsky also made a similar discovery, but he did something about it. He wrote the Monumentum pro Gesualdo, in which he set three madrigals for small orchestra which were turned into a ballet by Balanchine. Doing something about your discovery is the key to reintroducing him into the mainstream of musical life. BD: Let us talk a little more about Stravinsky. Was there any one specific thing that you learned from him? LS: I was pianist with the American Ballet at the age of sixteen, after having auditioned for Balanchine. That was an awesome experience because the sight reading was the key ingredient, the key demand. He played a few pages of the Glazunov ballet Raymonda in front of me, and these were two of the blackest pages I’d ever seen! You could see fourth-notes crawling all over the place. He told me to go. I nearly blacked out from nervousness, but I got the job — apparently after several dozen other pianists had been auditioned. The initial demands were to rehearse the dances and the ballets for operas, because the company at the time was the official ballet company for the Metropolitan Opera. 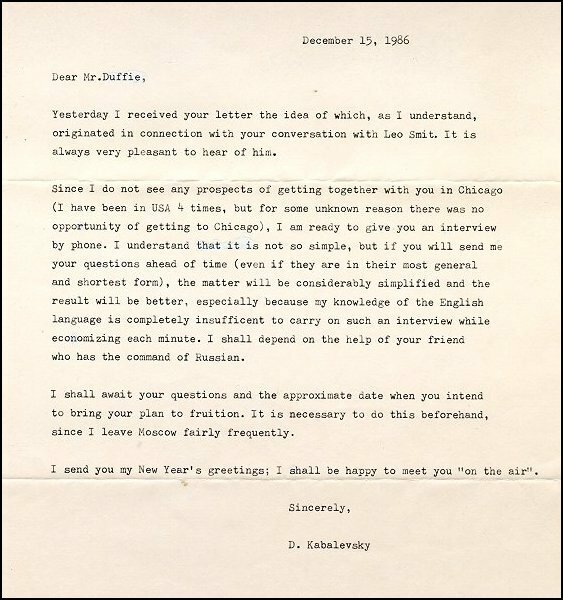 A few months after I’d been working at that job, Balanchine announced that Stravinsky was coming to America to conduct performances with the company of three ballets of his, including one that he had written especially for us, which was Jeu de cartes. The other two were Le baiser de la fée and Apollon Musagète. At the age of sixteen I thought of him as one of the greatest composers who ever lived. When he made his first appearance in the studio, I stood up and stared deep into his brain. It was just marvelous when he sprang into the room on grasshopper legs, dressed in a sporty jacket with a polka-dot bowtie. I was rather shocked at his outfit! I thought great man only wore dark clothes. [Laughs] He sat down, back to the mirror, looked at me a few times in order to see if I was ready, and we launched into the first deal. After this he came over to where I was sitting at the piano, and offered to play through the ballet, the entire work, for me and for Balanchine to set the tempos. It was as though he played without fingers, without tone, and in fact it was timed to a glissando what should have been fingered scales. His grunting and singing and breathing especially was very impressive. He seemed to be bumping into surprising bits of melody in his own music which seemed to please him enormously! He would grin in a kind of a bullfrog grin, as though some note had risen to his approval. That performance was like some kind of introduction to the deeper mysteries of life, and it’s just something unaccountable. I just don’t know how he did it, but when he finished playing, my whole feeling, my whole concept about time and rhythm, and about structure and the way in which you put the fingers into the keys somehow had changed. It was a unique experience for me, and of course it continued. I was his assistant conductor during the performances at the Metropolitan, and I ran the whole show backstage. I did the lighting. One of the more interesting and curious moments was when the dancers, waiting in the wings for their cues, didn’t go on on time because they’d become accustomed to hearing the music on the piano. Having had only two rehearsals with the orchestra, they simply didn’t recognize their music! So I ran around backstage, pushing them out on cue because I knew the ballet quite well by then. Once out on the stage they were able to pick up their beats and dance on happily till the end. After the performance, I went to the green room to thank Stravinsky for the marvelous experience of working with him, and he said — in Russian and French — “Molodetz, you are worth beaucoup d’argent.” That’s three languages, actually! It means “Fine lad, you’re worth a lot of money,” which was the ultimate Stravinskian compliment! LS: Well, acknowledged. [Laughs] Subsequently, I performed in his Les Noces. I captained the quartet of pianos. 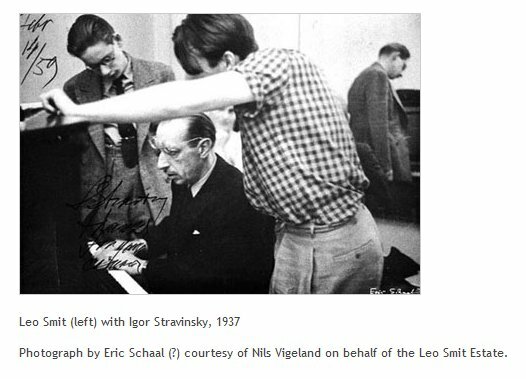 We were pianist-composers, Ingolf Dahl, Leonard Rosenman and Karl Kohn. This was at UCLA, and I believe it was 1960. That was a wonderful experience, too. BD: Let me ask about another name. You studied with Kabalevsky. What did you learn specifically from him? LS: Not much, because he kept insisting that I play slower. [Laughs] I remember that one word just sort of dominating the lessons. “Slower, slower, medlenneye, medlenneye.” I was eight at the time, and I had played for the director of the Moscow Conservatory [Alexander Goldenweiser]. Pianist and composer Alexander Goldenweiser was one of the great founders of the Russian Piano School, a tirelessly dedicated pedagogue who helped establish the very system of teaching piano in Russia that has led to many successful concert artists. Born in what is now Chisinau, Moldova, Goldenweiser's musical training as pianist and composer commenced once his family settled in Moscow in 1883, taking private lessons with Vasily Prokhunin, a student of Tchaikovsky. 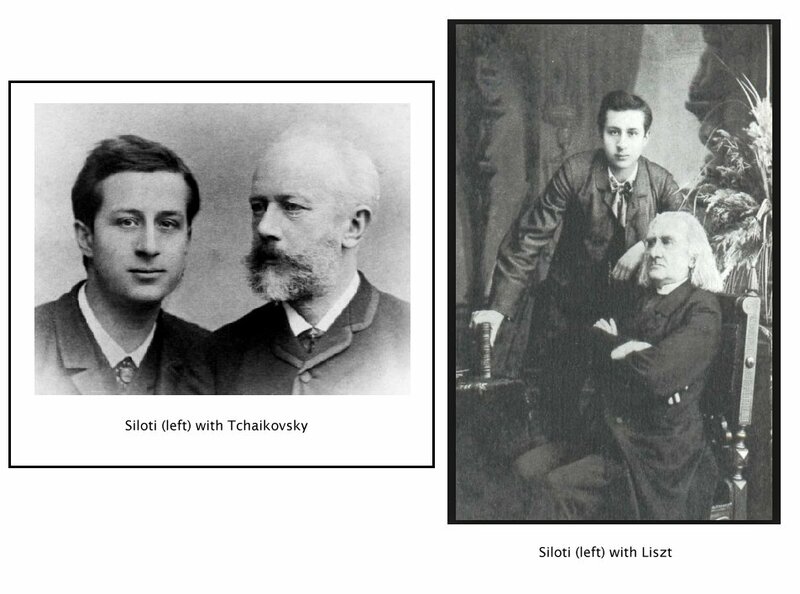 Goldenweiser's term as student at the Moscow Conservatory began in 1889, where he studied with Alexander Siloti, Sergey Taneyev, Ferruccio Busoni, and Anton Arensky; he made his debut in 1896 in a duet recital with fellow student Sergey Rachmaninoff. 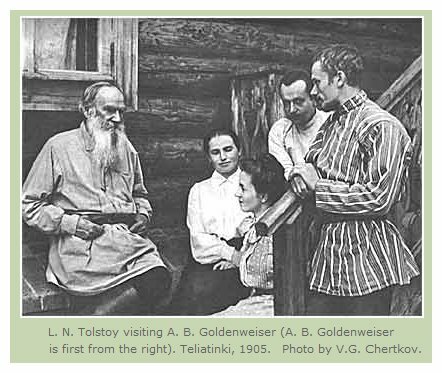 In his youth, Goldenweiser was a close friend of author Leo Tolstoy, and transcribed practically every word they shared together, publishing such comments in book form after Tolstoy died in 1910. We also owe the existence of Tolstoy's only musical composition to Goldenweiser, who took it down after Tolstoy played it to him in 1906. Just a year after his debut, Goldenweiser began to teach, and in 1906 was named to the staff of the Moscow Conservatoire, where he taught for the next 55 years. 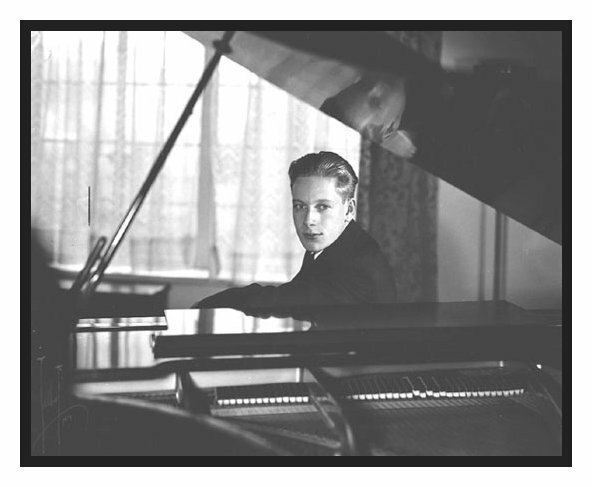 Goldenweiser also founded the Central Special Music School as an adjunct to the Moscow Conservatory in 1932 especially for the training of pianists; it remains in operation. Among the pianists who passed through Goldenweiser's instruction were Lazar Berman, Samuil Feinberg, Dmitry Kabalevsky, Tatiana Nikolayeva, Dmitry Paperno, and Nikolai Kapustin, though his favorite was Grigori Ginsburg who only outlived the master by less than a month. Goldenweiser was also a close friend to Alexander Scriabin and active in the founding of the Scriabin Museum in the 1920s. Rachmaninoff dedicated his Suite No. 2 for two pianos, Op. 17, to Goldenweiser and he enjoyed a lifelong friendship with Nikolay Medtner. Goldenweiser never made piano rolls and did not record until 1946, when he was named a People's Artist of the USSR. He was 71 at the time and would go on to make many records up until his death at age 86; while many of his recordings are outstanding, they are uneven owing to his advanced age and the poor sound of many Soviet-era recordings. As a composer, Goldenweiser published his first composition in 1887 and continued to compose through 1912, when he breaks off -- he did not pick it up again until the early 1930s, then continuing until his death. One of the last recordings he made was of his own Piano Trio in E minor, Op. 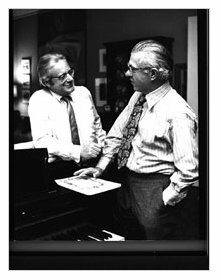 31, partnered by cellist Mstislav Rostropovich and violinist Leonid Kogan. BD: Did you speak to him in Russian? BD: Was he pleased to see you, though? LS: Oh, yes. I had premiered his Second Piano Concerto with the NBC Symphony in ’43, and I edited a piano prelude for the American edition. We had kept in touch. 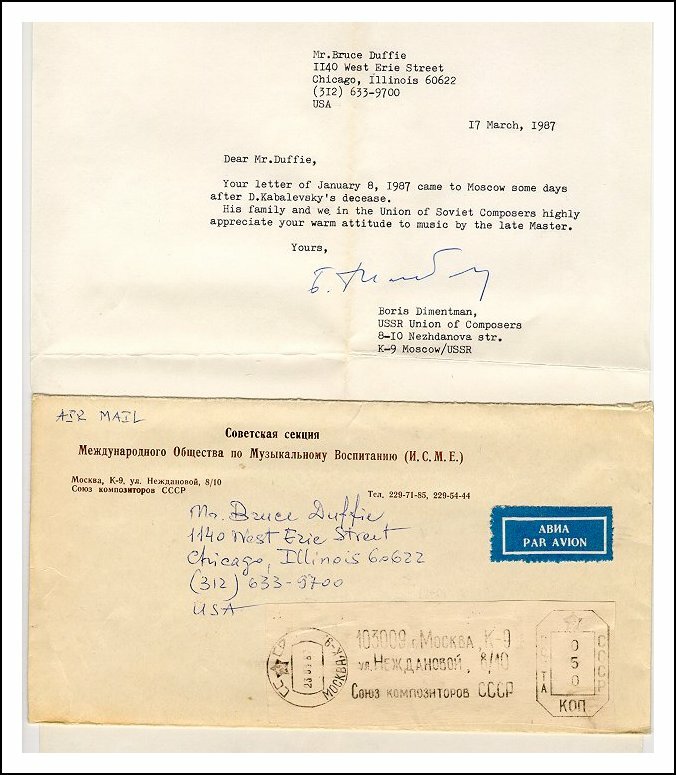 Most recently I received regards from him from Thomas Frost, who was Horowitz’s recording engineer on his recent visit to the Soviet Union. 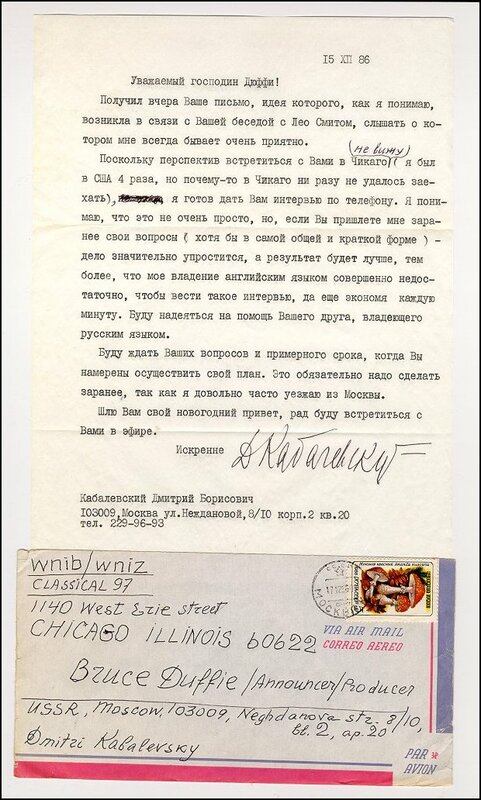 Kabalevsky remembered everything, and asked me to write to him, which I just did. He apparently is a garrulous old guy of about 78, and he’s full of pep. He has survived a long time, yes. He’s one of the few. A friend of mine translated it for me . . . . . I dispatched another letter with the requested material, but alas, it was simply too late . . . . .
BD: There’s one other name I want to be sure and ask you about — José Iturbi. LS: Oh, yes. I heard him play and liked his playing very much. I remember going — I was about eleven at the time. I went backstage and I asked him if he wouldn’t hear me play. He snapped me up. I didn’t have formal lessons with him; it was more a question of being around and observing his way of life, and occasionally playing for him. But it was a very interesting experience because he was conducting a lot in those days. I traveled with him here and there, and became acquainted with a lot of orchestral music including some Mahler. He did do one thing, at least — he strengthened my fingers quite a lot. BD: You’ve written one opera and I want to be sure and ask about that. 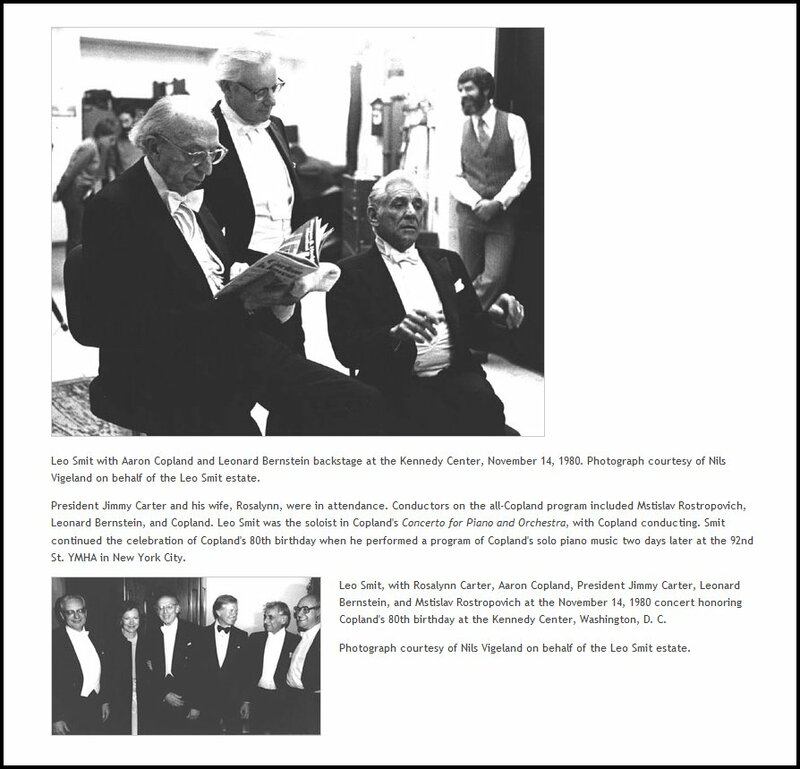 LS: The man who really had a very strong influence on me and was a great friend was Fred Hoyle [shown with Smit in the next photo], the astronomer, who did provide me with two librettos, one for a work on Copernicus and the other for an opera as yet unperformed, The Alchemy of Love. BD: If this is unperformed, then it was not commissioned? LS: That was not commissioned, right. BD: After so many years of being a pianist and writing other kinds of music, why did you decide that you wanted to write an opera? BD: He provided the libretto for the opera? LS: Yes. It was his idea. The Alchemy of Love is about a young, naïve but brilliant alchemist who discovers the secret of making of gold — how to transmute lead into gold — which interests the big, bad world immediately. It is a kind of a space fable. It’s supposed to take place on another planet which bears uncomfortable resemblances to our own. Some people are looking at it right now, and I’m still hoping. BD: Is it a “message opera”? LS: Oh, yes. All opera should be — at least classical opera. The moral is important, especially if it’s a fable. Definitely, and it does come in the form of a cantata-like finale. There is no acting; there is no action. It is pure singing. It starts with the solos, then duets and quartets, and then with sextets of all the principals. BD: Then why do you call it an opera and not a cantata? LS: Because there’s a lot of action up until the finale. A lot, and it contains all the elements that operas normally do contain. A cantata’s much more restrictive, but with an opera, all the characters that go together will make it. Another very important figure in my life was Alexander Siloti. He was Liszt’s favorite pupil. He’s in all the books. He’s in many photographs. Before he returned home to Russia, Liszt wrote a piece especially for him, a farewell, based on a Russian folk song. It’s only recently been published. I attended one of Siloti’s recitals in New York. I must have been about nine or so, and his playing was the first that deeply moved me in such a way that although very shy at the time, I asked my father to take me backstage so I could get a look at him. He was tall; he was about six-four, very elegant and gentle. I just stood in the corner looking at him, and suddenly I felt myself being swept up practically to the ceiling. He saw me — I was the only kid in the room — and he reached down and hoisted me up in the air. On the way down he kissed me on the forehead. I burst into tears, I was so moved. I couldn’t be controlled. To this day I never forgot the nobility of his tone. From 1901-1903 Siloti led the Moscow Philharmonic; from 1903-1917 he organized, financed, and conducted the supremely influential Siloti Concerts in St. Petersburg. He presented Auer, Casals, Chaliapin, Enesco, Hofmann, Landowska, Mengelberg, Mottl, Nikisch, Schoenberg and Weingartner, and local and world premieres by Debussy, Elgar, Glazunov, Prokofiev, Rachmaninov, Rimsky-Korsakov, Scriabin, Sibelius, Stravinsky and others. Diaghilev first heard Stravinsky at a Siloti Concert. Two years later I heard Prokofiev play at the Waldorf Astoria. He really did something to me because he approached the piano first through his hands at the keys as though he were washing them with such abandon and such lack of self-consciousness, or concern! I’d seen so many pianists fuss, you know, wipe the keys and adjust the bench. He just sat down, and he played with such spontaneity and abandon that it really affected my whole approach to the instrument. He played some very difficult things, like the Second Piano Sonata and the Toccata, no less. BD: Now is that the way you play — with more abandon? LS: He opened me up a little, without ever realizing it, probably. Then came the Stravinsky episode, and after that I played for Bartók. That was a moving experience. Then playing for Copland was the final encouragement, because after I played his Piano Sonata for him, which he had just completed, he began to say nice things. I asked him if he had any hot tips for me, anything that he would have wanted me to do or thought needed some change or improvement, but he said, “No, not at all.” He said, “I’m more interested in the variety of performances, and not in having everyone play it the same way.” Obviously, everyone plays it the way he wants it to go, to be played. It’s very impressive, that detached and objective view, and the basic curiosity that lay underneath it affected me, also. BD: Do you feel that same way, then, about your music, when you hear other people play it? LS: No. [Laughs] I’m not quite as disinterested or as impartial. It’s a great gift. I don’t share it with Copland to that extent, maybe because he’s not performing as a pianist except in his own music. That could be it. There are certain margins or certain boundaries within which much is acceptable. But if the character is missed completely — and so much of it rotates around the idea of tempo — you get the feeling that they really don’t understand the thing at all! Then, of course, you wish that you could intervene somehow. BD: For the most part, though, are you pleased with the performances you hear of your music? 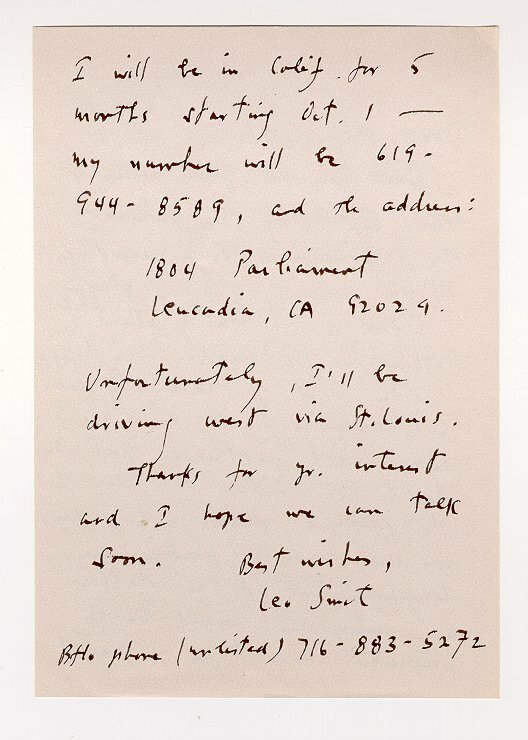 LS: I’ve been very lucky, really lucky, because in the orchestral repertoire, my music has been conducted by Copland, Bernstein, Munch, Krips and Lukas Foss. I’ve really been very lucky in having such stupendous musicians devote themselves. I must say something about Bernstein. In spite of the great excitement that he produces in performance, he’s even more remarkable in rehearsal. I think he’s at his best there. It is incredibly to see him work, to see him in action penetrating your very innermost thoughts! This is what I mentioned earlier on. It’s even scary at times, but he seems to know exactly what you were thinking or how you were trying to avoid certain problems. He becomes a kind of alter ego to you, and if he likes the music you’re just in seventh heaven because he’s devoting all his gifts to the realization of your music. That’s an extraordinary gift in itself. He may have learned something of that technique from Koussevitzky, for whom the composer was God, especially when he was being performed that week. I never experienced that pleasure, but I know others who have, and it’s unforgettable. BD: When you play your own piano music, are you the ideal interpreter? LS: Well, I’m not the only one, that’s for sure. Recently, a pianist named Claudia Hoca recorded a whole bunch of my piano things. She studied with me for a while, but she was a finished performer when she came to me, really. I just aroused in her more interest in the 20th century. It’s a question of repertoire and range. She had studied largely in Vienna, and had not had the 20th century experience. BD: As a generality, how do we get more people interested in music of the 20th century — not just performers, but audiences? LS: If performers would be more interested, then they could instruct through their example. By their performances they could instruct audiences, which is exactly what Koussevitzky did in Boston. He encountered fierce resistance when he first started to program new works there, but he didn’t give up. He insisted, and after ten years or so they became aware of what he was doing and how interested the whole world was in happening there. So they became part of his approach and they were very proud of him, and it was one of the most wonderful places for contemporary music in the world. In fact, his list of commissions is a history of the 20th century. So it’s really up to the performers to be consistent, and eventually, if they’re lucky, they’ll win out, or at least make a dent. BD: So in that case, you are playing both sides of the fence! BD: By being the performer of other people’s new music and composing your own music. LS: Yes. That is true. I guess it’s unusual today, but it wasn’t in the past. Liszt is a good example and Saint-Saëns is a good example. They all played other people’s music, as did Anton Rubinstein. LS: I guess I ought to be. I believe that the creative mentality will survive. It will go on, even if you don’t see brilliant flashes at this point in history. There’s no reason why it should not. It’s like thinking all chess games have already been played. I don’t think all the music has been written yet. BD: That’s a nice analogy. I like that. 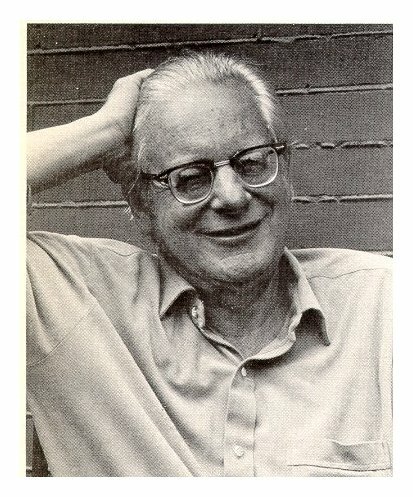 LS: There’s one figure in American music, Harold Shapero, who represents one of the most fascinating cases. In his twenties he showed prodigious talent. More than that, he had a mastery of a kind that even impressed Stravinsky and Copland to say that he was certainly the most gifted of that generation. Then around 1950 he slowed down. His output has virtually come to a trickle, which is one of the great tragedies for American music. 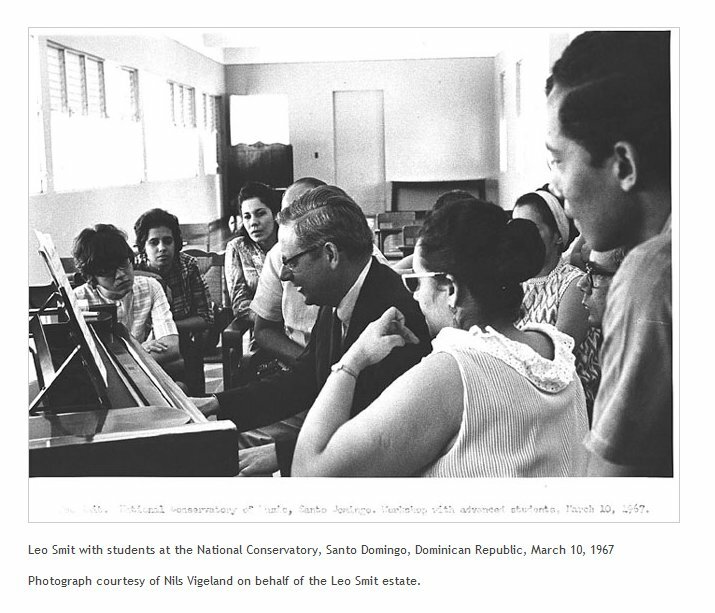 He’s teaching at Brandeis University, and at one point became interested in electronic music. So I thought, “Whoa, when a real composer will apply himself to electronic music, we might hear something at last!” But there’s some strange inhibition there. BD: So you don’t think that the electronic works so far have been real compositions? LS: Some of them have been very interesting and promising — Stockhausen’s work, for example. But even in the case of Berio, his acoustic music is more interesting. A work like his Sinfonia will stand up. Although, I must say, one of my favorite works is the Omaggio a Joyce, which is electronic, and that’s great. BD: Let me ask you about the other side of the electronic world today — the proliferation of recordings. Do you think this is a good thing for performers or audiences? BD: So you feel, then, there is some music which is justly neglected? LS: Justly neglected? Well, that it’s unjustly performed. Put it that way. Almost every Baroque composer who ever wrote something in 4/4 time is being dug up and put on record these days, because of this great love of what’s called “Pop Baroque.” Unfortunately, Bach is included in “Pop Baroque” but that’s another subject altogether. But I personally am grateful for the recordings of old music, and that includes a few centuries of great music, jazz, and the interesting works of our time. Interpretations come and go, and it’s a dangerous area to leave your reputation with, because when we listen to recordings of the great performers of the distant past, there’s a certain element of surprise and even disappointment from time to time when you consider their reputation and then match them up with their accomplishments. Many of the singers really sound like little birds twittering away, in contrast with some of the great singers we have today. But it’s like tragic actors — they all look comical, some twenty or thirty years later. We have films of Sarah Bernhardt and others, and they seem to be melodramatic and overdoing it. So you never know what posterity holds in mind for the interpreters, especially. It’s tough enough for the creator, but for the interpreter? BD: Are the young performers today getting technically better? LS: I don’t think so. BD: [Surprised] It’s two different questions — technically and artistically. LS: Yes. Okay, let’s talk about performers and attitudes. For instance, a cliché of a young pianist making a debut is that it’s whirlwinds of octaves and he’s all over the keyboard. Brilliant technique, but he didn’t have any depth or musicality. I’m not sure about that. The other point is that Horowitz these days is being written about as the last of the romantics. I don’t think that is correct, because when he started out he was a modernist. He grew up with the music of Scriabin of Rachmaninoff, very close to Liszt and Medtner and other composers of that period. He adopted techniques to express the music that was really contemporary, and in that sense he was a modernist! He developed a technique which was faster, clearer, stronger, lighter, and tone that was so subtle and so gentle and so powerful. He could do almost everything. Parenthetically, I think he’s the greatest keyboard artist — keyboard genius — I’ve ever heard, maybe of all time. But to say that he’s a romantic because he plays Chopin? I think it’s entirely wrong. What made him exciting, and keeps him exciting to this day is the fact that he was a contemporary, a modern performer. He really changed the parameters. He changed the dimensions of keyboard playing. LS: Definitely! He expanded them in every way, as Liszt did in his time, undoubtedly, by all accounts. It’s easy to mistake a man by his repertoire — in other words, by the company he keeps. [Laughs] This is certainly true of the great conductors. Koussevitzky with Stravinsky and Prokofiev and Debussy, and Bruno Walter with Mahler and Bruckner, and Toscanini with Verdi and Puccini. These are the composers that these men grew up with, and they were modernists. They were contemporary, very much so. No one is born a romantic! The curious thing is that a romantic at the early part of the 19th century was someone who was against neoclassicism, who was against the depiction of Napoleon as Caesar, for example. The romantic depicted Napoleon as he was, a modern man with modern weapons, not as a Roman emperor which was the classical way of doing it. The romantic wouldn’t dream of putting him in a toga or with a wreath around his forehead. So the romantic, according to Stendahl, was the modern man, the modernist in his own time. BD: Is this how you have tried to live your life? LS: [Sighs] Well, I guess one is a complex profusion of so many elements in one’s background and in things that attract you, the things that you love. When I was about fourteen years old, I remember listening to three recordings which had just come out simultaneously — Hindemith’s Mathis der Mahler Symphony, the Shostakovich First Symphony — which I thought was quite splendid for a teenager — and to crown it off, the Symphony of Psalms. I walked around in a daze for about two or three days. I just didn’t feel like talking to anyone. I was in another world. BD: This was a concert you heard? LS: No, recordings, played for me by a man who was a friend of the family who tutored me for a while and then became a close friend. He was considerably older than I was; he was about two-and-a-half times my age, but we had a lot in common. That is the key element — hearing something and just being overwhelmed without any preparation, which I really didn’t have at the age of fourteen. So it’s possible to be untutored in the ways of contemporary music and still fall in love. BD: But we’ve got to try and reach out catch more people. LS: Yes. Well, it’s another world today, isn’t it? BD: Should we try to get the people who go to rock concerts to come to orchestral concerts or piano recitals? LS: How are you going to do that? BD: Should we at least try? BD: That’s right, it’s all improvised. LS: I got to know Pete Johnson when I went to live in Buffalo. He was living there in enforced retirement, having suffered a stroke. I remembered hearing him play at the great concert in Carnegie Hall, “From Virgil to Swing” in 1938. I remember him distinctly playing “Roll ’em, Pete.” Oh, he’s marvelous! I went to see him just to introduce myself. We became friends, and at one point I asked him if he knew how to read music. He said, “No, but I traveled in fast company.” His ears were his eyes. After hearing a song once, he could play it! Great talent. Extraordinary pianist. BD: What is next on the calendar for Leo Smit? LS: I just made my second comeback of the year in Los Angeles. I did a program called “Liszt in Italy.” Thirteen piano pieces accompanied by about 170 color slides I took — scenes in Italy associated with these mostly programmatic pieces. That was very gratifying because I had had several surgeries just prior to this event, including one for the hand and three on the eye. Now I’m composing, and I’ll get back to playing piano in public in the spring. BD: What are the compositions you’re working on? LS: I just finished a little piano piece that was commissioned by a friend, a rather nice piece called Piano Madrigal. Another project will involve the setting of some Yugoslav folk melodies used by Beethoven and Haydn in various symphonic and chamber works, which I found in Bela Bartók’s collection of Yugoslav folk music. I don’t want to give too much away, but I think it’s just going to startle people to realize, for example, that the melody which opens the Pastoral Symphony is a Yugoslav folk melody. In fact there are three versions in Bartók’s collection with three different texts. These settings will also include my versions of the texts, freely translated from the original. I’m planning to call it From Banja Luka! It’s a city in northern Yugoslavia, part of the Austro-Hungarian Empire from which some of these melodies were gathered in small villages near Banja Luka. There are a few other projects, but it is too early to discuss them. BD: I understand. I’m just always curious, and I wanted to make sure that you were still working on composing. BD: How long will you spend in California? Will you be there the whole winter? LS: Yes. I’ll be coming back east in March. Before that, there is a performance in New York that interests me — two works of mine, including one of my favorites, at the Bowery Ensemble at Cooper Union in January. They’re doing a piece called Flute of Wonder, and another work called In Woods, for oboe, harp, and percussion. So I’ll be showing up for that. BD: You’ll just bop into town and then go back to California? LS: I will bop into town with my return ticket in pocket. Right! BD: Amazing! I appreciate your spending the time with me. I have gained a great deal of insight into the man behind the recordings that I’ve been listening to. LS: Well, Bruce, I must say that you make it very easy, and I don’t believe that the hour has passed. BD: There are a thousand more things that we can talk about, and perhaps we’ll have a chance to do that at a subsequent occasion. This interview was recorded on the telephone on November 5, 1986. Segments were used (with recordings) on WNIB in 1991 and 1996. The transcription was made and posted on this website in 2013.